RedhookGreen: Cutting vs. Bleeding Edge? Well here we are nearly a month since my last post. So what's going on? Well, as they say the devil is in the details, and we have been finalizing lots of the details on the energy generation, HVAC and construction of this amazing building. 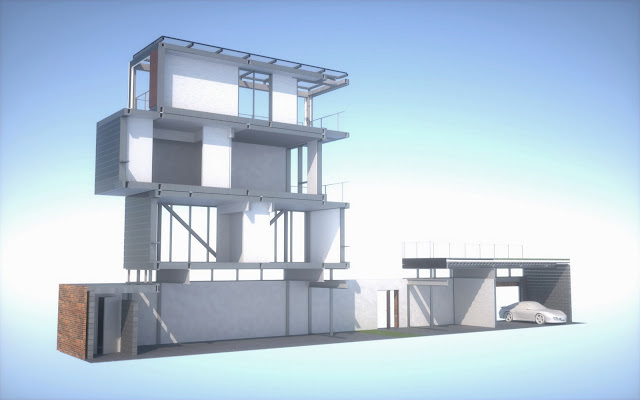 Good news is the design is locked, and I have included some new images, a cross section and 3-D visualization of assembly and views of the house. But there has been a lot of back and fourth on the final energy generation plan and associated HVAC system. You may remember from and earlier post "Getting to Zero" we were wrestling with how to generate enough power for the main building, garage including electric car charger and workshop with the 850 feet of we had for solar panels. Well the solution that I described that utilized the PVT or Hybrid Solar Panels, seemed at that point to fit my "Keep it simple"mantra, but after a great deal of investigation, much of it dealing with a German manufacturer, it became much more complex and expensive. While wrestling with what was technically elegant, and very "bleeding edge", we stumbled on a great solution from Sanyo to increase our solar yield from a more traditional, but "Cutting Edge" solution. 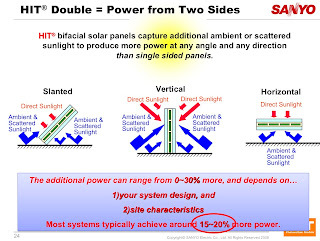 Sanyo's HIT® bifacial solar panels capture additional ambient or scattered sunlight to produce more power at any angle and any direction than single sided panels, therefore addressing our yield issues. If you notice on the cross section drawing the solar panels are now lifted off the roof to allow abient light to be captured as well as under the awning over the fourth floor. 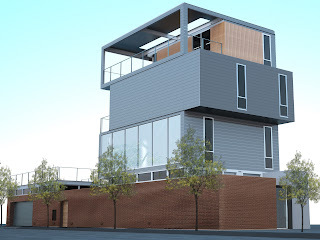 With this solution in hand we SHOULD be able to lock this part of the plan and go to press with the final drawings for the NYC Building Department. We have gotten some very preliminary numbers back from one of our possible builders and we are within our planned budget, so that is good news. So while we are now behind an additional 30 days, we should be able to pick up the time and get back on schedule. Thank you for you continued interest, I will be posting more regularly as we move out of this more cerebral phase, into the more action oriented one (my favorite). 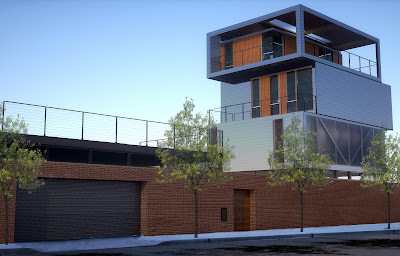 Take a minute and review this new 3-D rendering, it illustrates the modular assembly as well as 360 degree views of the structure.